My Main Website Link - This is where the URL for the site is located and there is also a neat feature to change the main URL to a lead capture page or other pages as designated by admin. Unlmited websites and domains can be used with our system. 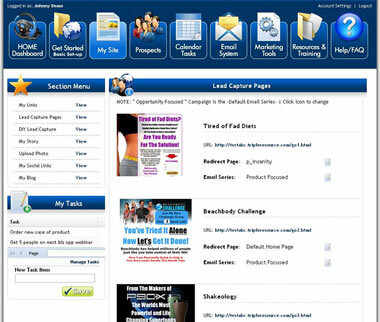 If you've got the budget, you can give your distributors an incredbile amount of marketing pages, information pages, video pages, you name it. Design it, upload it and it's done for the reps.
We use a "Callback Request" form on all system so that the usual replicated website portion of the system, can also capture interested prospect's information. 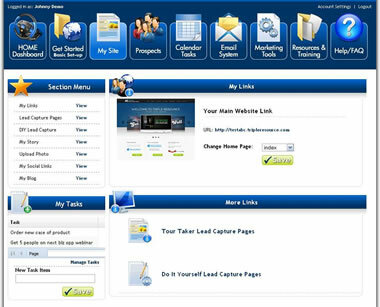 Tour Taker Lead Capture Pages - Tour Taker lead capture pages are "ready to go" for the user. They simply start advertising the link.